Deep in the tunnels of Moscow's Metro, a mother tells her child that life wasn't always confined to an endless stretch of cement and darkness. People used to live on the surface. But you've just come back from that place; beneath ever-present clouds sits the empty husk of a decimated civilization, every inch of which is enveloped in radiation. If that doesn't kill you, the mutants probably will. The world above is terrifying, but the sad truth is it's not much worse than life below. Warring political factions have splintered what remains of the human race. Mankind may have survived a nuclear holocaust, but it's trying its damnedest to snuff itself out. 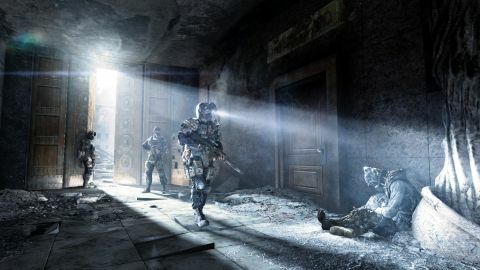 Both Metro 2033 and Metro: Last Light paint a hopelessly bleak picture with their fantastic, almost tangible portrayal of a post-apocalyptic world. Every radiation-made monster wants you for dinner; every human being has a secret, selfish agenda; and your only reprieve from the deadly wasteland above or tunnels below are makeshift Metro towns in which people sob aloud as they eat pasty-looking mushroom soup for the hundredth night in a row. It's all terribly harrowing, and prettier than ever thanks to Metro Redux's glorious visual facelift. As a young man named Artyom, you'll be sent on a series of high-profile missions, which will have you exploring rarely-traveled tunnels full of monsters, bandits, and other unsavory characters, in addition to the hostile world above. All of these places are rife with environmental storytelling cues, and you'll really get a great sense of the struggles and dangers that come with living in a post-nuclear world. Exploring some areas can be a bit confusing, though. While Metro 2033 and Last Light are far from being open world games, there's no hand-holding compass to tell you where to go so you'll have to spend a bit of time figuring out how to progress should you miss a lever or cleverly hidden passageway. When Metro 2033 and Last Light came out, playing them on a high-end PC was the only way to go. They are incredibly gorgeous games--and the visual overhaul that both receive in Metro Redux finally does them justice on consoles. Also, they now run at 60fps--a significant change from their non-Redux counterparts, which has the added benefit of making gunplay feel far more accommodating than the too-sluggish 30fps. These are fantastic games, and Redux's graphical improvements and gameplay tweaks make them even better. If you haven't played Metro, now is the time. Still, the atmosphere here is of a caliber that many games fail to achieve, and its grim tones bleed into Redux's every mechanic to create an incredibly immersive experience. Navigating a tunnel deep within the Metro network is excruciatingly isolating; the hairs will stand up on the back of your neck once your flashlight dies and you have to spend precious seconds manually recharging it with a crank as mutant spiders scurry about. You'll feel a powerful sense of urgency whenever the filter on Artyom's gas mask needs to be swapped out and you're all out of spares, or when the mask's visor cracks and there's no replacement to be found. And you'll feel the choking grip of panic when you're surrounded by more hellish creatures than you have bullets to put down. Even Artyom's arsenal reflects the world in which he lives. Most firearms, for example, aren't your standard shooter affair, but rather makeshift armaments built from scrap. Their inventive designs--like a shotgun that feeds shells to the chamber via a rotating cylinder, or a pneumatic gun that must be pumped Super Soaker-style to hurl metal spikes--not only make for interesting combat scenarios, but also drive home that humans have to make do with limited resources. It's hard to resist trying all the new guns as you find them, and eventually you'll build a loadout of favorites that cater to your preferred playstyle: stealth, guns-blazing, or a mixture of both. It's entirely possible to bypass most human enemies by staying hidden and taking advantage of vent shafts or maintenance corridors, and shooting out lights will help you remain undetected. It's also extremely satisfying to mess with foes, as the AI reacts to your actions in a logical, lifelike way. Taking one out from the shadows with a silenced weapon, for instance, will send the rest into panic mode as they begin searching for you. Likewise, initiating a firefight with a grenade will often cause enemies to raise an alarm or, in the case of an encounter that took place in some sort of engine room, seal all the doors and flood the area with a deadly gas, forcing you to equip a vision-obscuring gas mask. Every encounter, save for a few mediocre boss battles that are a relic of old shooter design, offers a wealth of strategic opportunity, which helps Last Light and its predecessor stand apart from the average shooter. The Metro series has always felt a bit sluggish when it comes to frantic gunplay, partially because last-gen consoles sometimes struggled with framerate dips. Not so in Redux, which runs at a steady 60fps. Though this is a pretty obvious expectation from a remastered package, Metro 2033 and Last Light look significantly better on the PS4 and Xbox One compared to their last-gen counterparts. Survivor means ammo is far more limited, imbuing the game with a sort of survivor-horror feel. Spartan makes each game play like a more traditional shooter. You can also toggle Ranger Mode, which deactivates the HUD and crosshairs for a more immersive experience. Gun packs, extra missions that let you play as new characters, challenges with online leaderboards--all of the DLC for both Metro games is included in Redux. Not sure you want to plop down $50/£29.86 for the whole package? You can purchase the Redux version of Metro 2033 and Last Light piecemeal, with each retailing at $24.99. So, too, does its fantastic sense of pacing. There are plenty of moments where you'll spend time in a Metro station taking in the sights before heading out to your next objective. Eavesdropping on the locals is a great way to hear some fascinating stories, and in one station you can even sit down and watch a 30-minute theater performance, an event that can be passed up entirely. It's easy to lose an hour or two admiring the surprising level of detail packed into each location, and rushing through a non-combat zone to get back to the killing is a huge disservice to the subtle stories housed within the metro tunnels. Indeed, subtlety is what makes Metro 2033 and Last Light such exceptionally immersive games. They nail the core tenets of a shooter, then force you to react to enemies in ways outside of simply taking cover. They plop you in a post-apocalyptic world, then fill it with tons of minor but substantial details, like the shadows of once-living people now permanently nuked into stone walls. They strip you of hope, only to dangle a tiny sliver of it ahead of you like a carrot on a stick. And once the credits roll, long after you've lost track of body counts and the volume of setpiece explosions, it's the subtle things--like the mother explaining to her child that people used to live in houses instead of cement tunnels--that will stick with you the most. Not sure you want to plop down $50/29.86 for the whole package? You can purchase the Redux version of Metro 2033 and Last Light piecemeal, with each retailing at $24.99. Description Metro 2033 and Metro Last Light combined into one bundle for next gen consoles.